The RamlingKhind Galli was widened to 60 feet even after the initial protests of the residents, and now the entire street has become a parking lot and the main aim of widening, smooth movement of traffic was not fulfilled. On Friday night the traffic police department took up marking on the road 8 feet marking on each side of the road so that the designated place will be used for parking and there will be some discipline. 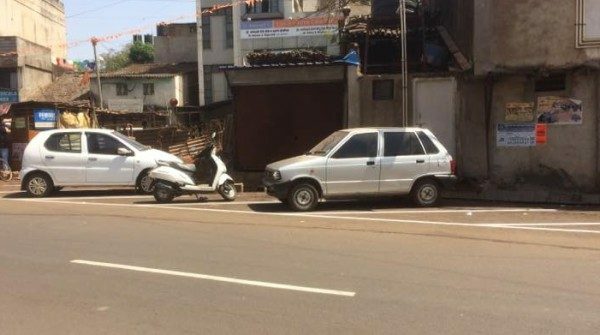 But the residents and shop owners opposed to this saying, we gave our land for free and now you are making this road a parking zone. Residents also had the issue of their entry been blocked as the parking was blocking the entry to their homes. The residents have decided to meet the Commissioner today and get the matter solved. It may be recalled that the Ramling Khind Galli was widened even after opposition of the local people and then even some lost 95% of their property and now with the police marking the street for parking the residents are asking did they give their land for Parking or for better and easy traffic flow. It seems,The residents oppose is correct. But the shop keepers may park their own vehicles there. At the same time, care should be taken as to widened road is not mis utilised either by the public or by the shop keepers. Care should be taken by competent authority as to smooth flow of vehicles and public.